The most recent "Illinois Weather and Crops" report, released September 17th, puts into words and figures statewide and regional crop maturity and harvest progress data. Corn. Statewide, 87% of corn has reached maturity, 35% more than the 5-year average and 29% more than at this time last year (Figure). 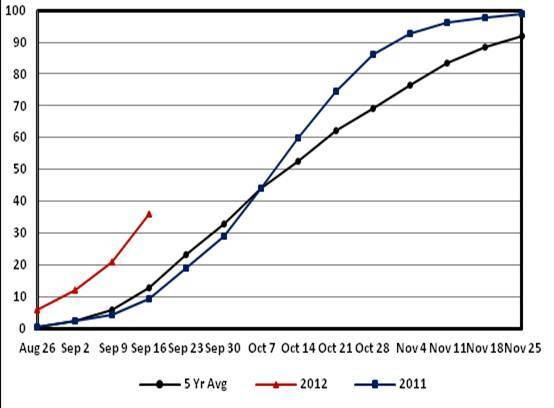 Statewide, 36% of the corn crop has been harvested, 27% more than this time in 2011 and 23% more than the 5-year average. Crop condition reflects the sustained drought conditions this year, with 7% of the crop in good condition, 18% fair, 33% poor and 42% in very poor condition. In the Western Illinois Crop Reporting District, 97% of the corn has reached maturity and 38% of harvest has been completed. 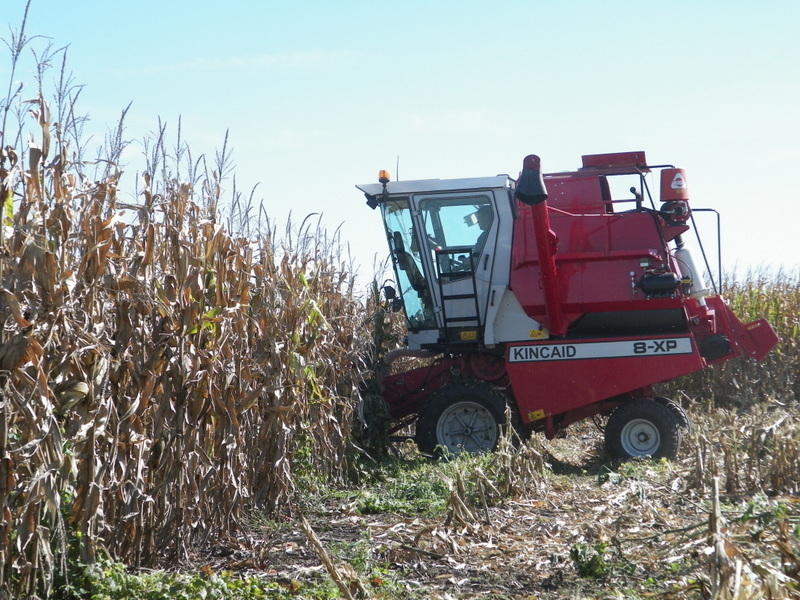 Corn harvest at the NWIARDC is in full swing, with approximately half of the bulk and experimental acreage harvested (Figures). The good soil conditions during the spring allowed Mr. Marty Johnson to begin and complete planting in a timely manner. Consequently, although yielding less than in 2011, corn is still yielding well. Corn yields are averaging between 195 and 200 bu/A. Soybean. Statewide, 79% of the soybeans have begun turning yellow, 45% are dropping leaves and 3% are harvested. Maturity at this point in time is further along than in years past, with 19% more dropping their leaves than in 2011 and 13% more than the 5-year average. Crop conditions statewide reflect both the drought and the indeterminate nature of soybean flowering, which allows pollination to take place over a longer period of time than in corn; thereby spreading out the period of risk. Soybean crop conditions statewide are better than corn, with 2% excellent, 19% good, 37% fair, 23% poor and 19% in very poor condition. 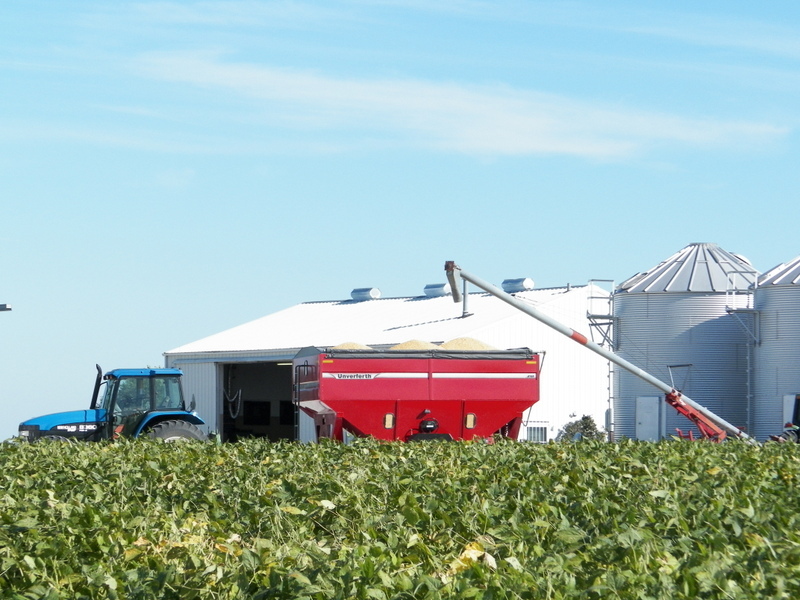 In the Western Illinois Crop Reporting District, 78% of the soybeans have yellowing leaves, 38% are dropping leaves and 1% of the crop has been harvested. Soybean harvest at the NWIARDC is likely to begin in 10 to 14 days.